A group of school children from Cornwall and a student from Wiltshire have won a competition for ideas on how satellites could improve life on Earth, Science Minister Sam Gyimah announced today (Friday 13 April). Ellie Jones, Jessica Knight, both 15, Summer Jeffery and Emily Haddrell, both 14, from Truro, scooped £7,500 for the best group entry in the UK Space Agency competition with their Surf Safe concept. Ieuan Higgs, from Chippenham, received £7,500 for the best individual entry for his Infrastructure Planning and Development Analysis Tool. The SatelLife Challenge supports the development of science, data handling and technological skills, complementing the Government’s Year of Engineering campaign which is championing careers in science, technology, engineering and mathematics to the next generation. “The UK leads the world in building satellites and we want to encourage young people like those entering this competition to get involved in every part of our thriving space sector. Ellie, Jessica, Summer and Emily’s idea was for a wristband that uses satellite location data and communications services to identify the locations of swimmers and surfers in the sea. “It was so exciting, finding out about the competition. We had never done anything at all like this before. As students living in Cornwall, the sea has always been important to us and from the very start we knew we wanted to do something involving the beach. It was such a surprise to find out we had won and every one was so happy when we got the email, for a long time, it didn’t seem real. When combined with tidal and rip tide data, this could provide real time tracking and identification of people approaching known danger areas, and provide coast guards or the Royal National Lifeboat Institution (RNLI) with potentially life-saving information. Ieuan Higgs’ winning idea was for a tool that would map change in urban areas using satellites and algorithms, identifying where building is taking place and potential sites for development. The competition is split into three age groups: 11 – 16; 16 – 18; 18 – 22, and a further seven entries from across the age categories were awarded £5,000. The judging panel was made up of experts from the UK Space Agency, the European Space Agency, the Satellite Applications Catapult in Harwell and industry. All nine winning entries will be able to pitch their ideas to a panel of ‘dragons’ from the space sector. In 2017 the competition winners were offered a mix of support including an offer to build a prototype, thousands of pounds worth of space on Amazon Cloud Services, access to data, business development advice and a visit to a satellite factory. 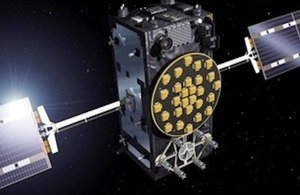 With one in four of all telecoms satellites already built substantially in Britain, the government’s Industrial Strategy includes plans to work with the industry to grow the space sector and establish commercial space launch services from the UK for the first time. Today’s announcement follows the news that Oxfordshire-based firm Reaction Engines has secured a further £26.5 million to support the development of SABRE™ - a revolutionary new class of aerospace engine combining jet and rocket technologies. The new strategic investors are Boeing HorizonX Ventures, the investment arm of the world’s largest aerospace company Boeing; and Rolls-Royce, which has been at the forefront of British engineering for over a century. Infrastructure Planning and Development Analysis Tool: This tool would map change in urban areas using satellites - it would identify where building has or is taking place and areas where there is potential for development or where an area is becoming run-down. This change detection would use algorithms rather than be totally manual. Surf Safe: This concept is for a wrist band that uses satellite location data and communications services to identify the locations of swimmers, surfers and other people just off the shoreline in the sea, which could be combined with tidal and rip tide data, to provide real time tracking and identification of people getting close to known danger areas. This could be used by coast guards, RLNI and other rescue agencies in the event of an incident. Capturing Earth’s changes: An application that uses Machine Learning Deep Artificial Neural Network to regularly ingest and analyse Earth Observation data to learn what the what the Earth looks like, and detect changes and patterns across the globe. The application would also be able to identify the causes of natural disasters through providing details of historical events, to help with preparation and prevention in the future. Measuring LED usage: This idea would use a spectrometer from space to identify whether light from the Earth is emitted from LEDs or from standard lights. This is important because LEDs are better for the environment as they are more energy efficient and progress in this area is of interest to environmentalists and the scientific community as well as local authorities and governments. Automated Person Detection: This idea uses drones for search and rescue. This is currently a military capability but the team showed how it could be used in a civilian capacity to identify life and deliver aid. They propose using machine learning to improve the ability of the drones to spot life. Displaced Person Aid: This idea looks at people who are internally displaced and how satellites can help meet their needs rather than those who are refugees. One opportunity for its use would be when there is a natural disaster such as a hurricane where it could provide information in advance for people who would need to move out of the way of the storm. MEDrone: This idea uses satellites and drones to help people in isolated areas who cannot access basic health care such as vaccines, birth control or medicine. This would use satellite data to find a remote region, then a drone to gather terrain data from the air, sending the information back via satellite. The drone would then land and allow people to use Skype to talk to health professionals. The drones could also transport swabs or samples and medicine. Illness Tracker: This app aimed to map and model the spread of infectious disease. This would not only help individuals who wanted to avoid illness, but also health authorities in getting medication to the right place. It would use the GPS elements of satellites and comms for remote locations. Satellite Imagery for Traffic Management: This idea used satellites to identify traffic areas of problems and re-route people. The idea would use real time data, and then use pace cars to control traffic and reduce phantom traffic jams.